The Notice to Employees - Injuries caused by Work is a workers compensation law poster by the California Department Of Industrial Relations. This is a mandatory posting for all employers in California, and businesses who fail to comply may be subject to fines or sanctions. This poster, posted in English and Spanish, must be posted in a conspicuous place where all employees will see it. This poster describes the benefits workers can get when hurt at work, how to get benefits, and what to do if your employer discriminates against you from getting harmed for a work injury or illness. It appears you don't have a PDF plugin for this browser. 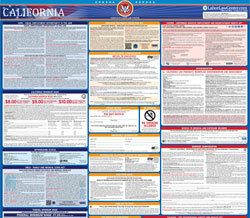 Please see the link below to download california-noticeposter.pdf. or by repeated exposures (such as hurting your wrist from doing the same motion over and over). more than 104 weeks within five years from the date of injury. mental function that a doctor can measure. permanent disability, and your employer does not offer you regular, modified, or alternative work.  Death Benefits: Paid to your dependents if you die from a work-related injury or illness. compensation that your employer is required to give to new employees. department. If you need first aid, contact your employer. treatment guidelines,  for your  alleged injury until the claim is accepted or rejected. 3. See Your Primary Treating Physician (PTP). This is the doctor with overall responsibility for treating your injury or illness. from your employer if you are covered by an HCO or a MPN. Contact your employer for more information. you when you are injured, unless you predesignated a personal physician or medical group. expenses up to limits set by the state. participation in any off-duty, recreational, social, or athletic activity that is not part of your work-related duties. compensación de trabajadores cubre la   mayoría de las lesiones y enfermedades físicas o mentales relacionadas con el trabajo. muñeca por hacer el mismo movimiento una y otra vez). cobro. Hay límites para visitas quiroprácticas, de terapia física y de terapia ocupacional. TD no se pagarán por más de 104 semanas dentro de cinco años después de la fecha de la lesión. permanente de su función física o mental que un  médico puede medir. lesión le ocasiona una incapacidad permanente, y su empleador no le ofrece a usted un trabajo regular, modificado, o alternativo. médico para que  atienda la lesión causada por el trabajo. trabajadores que se le exige a su empleador darle a los empleados nuevos. HCO o una MPN. Hable con su empleador para más información. trabajo, aumento de beneficios y gastos hasta los límites establecidos por el estado. delito grave y puede ser multado y encarcelado.